The pool covers that we install are safety covers that meet ATSM Standards. These covers keep kids, pets and any other family members from falling into the pool during the Outer Banks’ offseason. Also they are a tremendous help on keeping out leaves and debris along with UV light which causes algae. The covers are made of high quality dura mesh vinyl or polypropylene. The mesh’s shape and tautness is formed by triple stitched straps that are pulled tight and held in place by stainless steel tension springs. These springs are covered by an anti fouling rubber cover. The springs attach to brass anchors that are counter sunk into the pool deck when not in use. 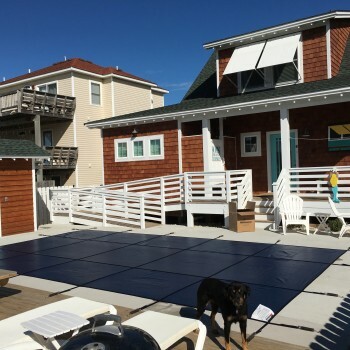 All of our pool covers come with a twelve year warranty and are made with quality material to with stand the Outer Banks harsh conditions. We are able to custom design your cover to fit any size or shape pool with a color of your choosing.